*Check out or "How-To" video below! You want to make sure you're protecting more than just your dorm items in college. When you're dorm room shopping for your dorm essentials, you're going to make sure you have a college dorm safe and a padlock for your dorm trunk in order to protect your valuable dorm necessities. Dorm security and dorm safety are about more than making sure your new dorm laptop is locked up when you're not in your college dorm room. Dorm safety is also about taking measures to protect yourself. When you're in college, there's going to be times that you are walking to and from class alone at night. 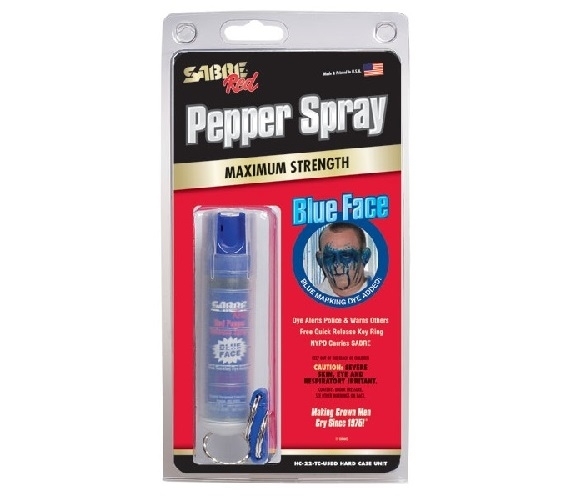 Make sure you have our Blue Face Pepper Spray in your college supplies for class. Keep it on your key chain and take it every where you go! Our Blue Face Pepper Spray isn't just ordinary pepper spray. This Pepper Spray has a blue dye in it that will mark the target's face blue for up to 48 hours! While the blue dye is an outstanding feature that makes this dorm essential a must have dorm item, there are other features that make this a dorm necessity. Our Blue Face Pepper Spray is police strength maximum heat with greater protection at a safe distance of up to 10 feet away. Plus there is reduced wind blow back so you can avoid getting pepper spray in your face, as well. Don't head to college without dorm safety college supplies that protect you!